London, UK: February 2014 – SanDisk Corporation, a global leader in flash storage solutions, today announced the SanDisk Extreme PRO® USB 3.0 flash drive, featuring professional-grade performance with some of the fastest speeds in the industry at up to 60 times faster than standard USB 2.0 drives, and providing a generous 128GB* of storage. The high-performance SanDisk Extreme PRO USB 3.0 flash drive takes advantage of the next-generation specification by providing write speeds up to 240MB/s and read speeds up to 260MB/s. These speeds allow users to transfer a full-length movie in seconds, or 1,000 hi-res photos in less than 35 seconds, making the drive ideal for carrying video and photo collections. 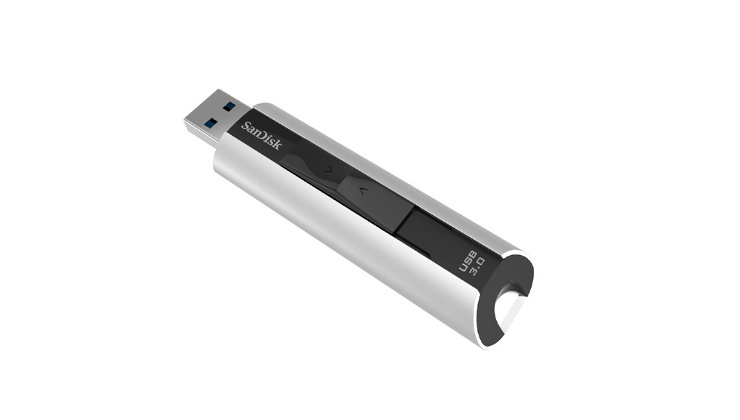 These are some of the reasons why USB 3.0-enabled device shipments will surpass two billion in 2016, up from approximately 600 million in 2013, according to Multimedia Research Group, Inc.
SanDisk’s Extreme PRO USB 3.0 flash drive offers a sophisticated and durable aluminum metal casing, which protects against everyday wear and tear. Also included is SanDisk SecureAccess™ software that provides 128-bit AES file encryption and password protection to secure private files while leaving the rest of the drive visible for sharing. The SanDisk Extreme PRO USB 3.0 flash drive is available worldwide now and on www.sandisk.com in a 128GB capacity. Local pricing for this model is TBC. Additionally, the drive is backed with a lifetime limited warranty and world-class customer support.